Left to right: Susan Etheredge '77, Jean Feiwel, Ann M. Martin '77, Liz Szabla, Susan Fliss. Photo by Lynne Graves. Video recordings of many of the Friends' events are available on the Libraries' YouTube channel. 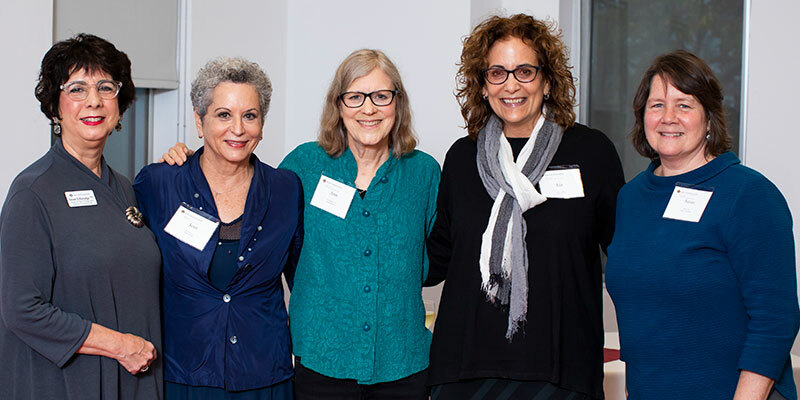 Ann M. Martin ’77, bestselling author of the Baby-sitter's Club series, and two legendary publishing professionals, Jean Feiwel and Liz Szabla, give an insider’s look at publishing for children over the past thirty years. Dean of the College and Vice President for Campus Life Susan Etheredge ‘77 moderated the panel. Thursday, October 11, 2018. View video. Kory Stamper '96, the author of Word by Word: The Secret Life of Dictionaries delivered the McGrath lecture. Stamper is a lexicographer at Merriam-Webster where she also writes, edits, and appears in the "Ask the Editor" video series. She blogs regularly on language and lexicography on her blog Harmless Drudgery, and her writing has appeared in The Guardian, The New York Times, and on Slate.com. Thursday October 5, 2017. View video. Werner Gundersheimer presented a lecture based on his collection of more than 600 published and manuscript travel narratives about Italy. Dr. Gundersheimer is director emeritus of the Folger Shakespeare Library in Washington D.C. Thursday, October 6, 2016. View video. Amy Ellis Nutt, author of the recent New York Times bestseller Becoming Nicole: The Transformation of an American Family, about a transgender identical twin, spoke about her work. April 14, 2016. View video. Author and journalist Brooke Hauser discussed her experiences researching the life of Helen Gurley Brown (1938-2012.) Monday, November 9, 2015. View video. New York Times best-selling novelist Meg Wolitzer spoke about her work, her time at Smith and the influence of Sylvia Plath. April 16, 2015. View video. Smith's new Director of Special Collections, Dr. Beth Myers, spoke on the place of Special Collections in the scholarly world of tomorrow. November 12, 2014. View video. The author of Orange is the New Black, Piper Kerman '92, spoke with book critic Bethanne Patrick '85 about her advocacy work highlighting the conditions of incarcerated women, and how the Netflix series is making this topic a national conversation. October 2, 2014. View video. Stuart Fuchs, aka "Stukulele," returned to campus. Fuchs specializes in Ukulele, Gypsy Jazz & Classical Guitar, Didjeridoo, and Percussion. September 27, 2014. Su Meck '14 read from her book "I Forgot to Remember"
Su, an Ada Comstock Scholar who graduated in May 2014, read from her book about her total memory loss following an accident at age 22. April 25, 2014. Four alums discussed how Smith influences their writing lives, 7:30 pm, Sweeney Concert Hall, October 18, 2013. View video. Ann M. Martin '77, author of The Baby-sitters Club® series took part in a panel discussion with David Levithan, Virginia Euwer Wolff '59 and Emma Straub. Moderated by Bethanne Patrick '85, April 11, 2013. View video. Former Smith College President Carol Christ and Susan Van Dyne, Professor of the Study of Women and Gender and Chair of the Archives Concentration gave a presentation on October 25, 2012. View video. Reeve Lindbergh read from her mother’s writings to provide context for this, the final installment of her published diaries. November 7th, 2012. View video. University of Virginia professor, Michael F. Suarez S.J., spoke about the enduring relevance of the printed book. Read more about his topic. April 4, 2012. A lecture presented by Harvard University Librarian Robert Darnton who is, among many things, the driving force behind the Digital Public Library of America project. March 12, 2012. View video. Nothing Daunted: The Unexpected Education of Two Society Girls in the West. Author and executive editor of The New Yorker, Dorothy Wickenden discussed the adventures of her grandmother Dorothy Woodruff with Rosamond Underwood (both 1909 alums) in remote Elkhead Colorado. March 1, 2012. “Book maven” Bethanne Patrick '85 moderated this very enjoyable discussion with May Chen ’00, Barbara Keiler ’74, Stephanie Dray ’93, and Sarah MacLean ’00, a best-selling regency romance novelist. Wednesday, April 13, 2011. View video. Lecture by Sarah Thomas ’70, Bodley’s Librarian & Director of the Oxford University Library Services; former chair of the Friends of the Smith College Libraries; and Smith Medal recipient, 2010. April 14, 2010. View video. William Allan Neilson: "A King o' Men [and Women!] for a' That"
A lecture on the life and legacy of Smith’s third president by Peter I. Rose, Sophia Smith Professor Emeritus of Sociology and Anthropology. February 18, 2010. Neilson Library opened for research and discovery on November 22, 1909. To celebrate the Library’s centennial and document the history of Smith's first library building, the College Archives presents this online exhibition. Each of Smith College’s branch libraries has its own unique history and place within the scholarly community. The exhibitions give some background of the events and people behind their founding, and the physical spaces they have occupied over the years.